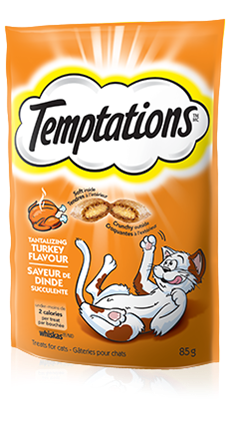 Mouth-watering, rich Turkey flavour your feline friend craves. No artificial flavours. 100% nutritionally complete. TEMPTATIONS® Tantalizing Turkey is rated4.7 out of5 by56. Rated 5 out of5 byCARLEIGH_BON_3711346349 fromMy cats were very excited to try these treats. They have tried some other flavours of the temptations treats and had not tried this flavour before. They absolutely loved this flavour and we're constantly meowing for more. I have repurchased multiple times since my cats have tried them, they are obsessed. Rated 5 out of5 byFRANCINELON_4281368388 fromI have 4 cats. They're all a little different and have their own like and dislike. One of my cats is a Bengal and does not eat anything hard. She didn't eat this, but no surprise there. My 3 other cats all loved it and were begging for more. I will definitely buy this product for them. Rated 5 out of5 byLouie fromLouie love temptations!My Siamese cat Louie loves his temptations! We have tried almost every kind there is out there and he loves them all!! We haven’t had the chance to enjoy the catnip and cheese kind yet. Haven’t seen them in the store but I will definitely be keeping my eye out for them! Rated 5 out of5 byJennbru83 fromMy cats both LOVE these! !I received a coupon for a free bag of cat treats and picked it up just a couple days ago. One of my cats is very picky and usually refuses treats. He meowed for more!! My other cat is hard to keep away from them. Thanks to Whiskas for a treat my cats love! Rated 3 out of5 byANDREWBON_3711414271 fromSize of the bag is too big. I have only one cat, and it will take months to finish off this bag. The treats are decent though. I like the calorie count and size. He seems to like the flavour, though not as much as some others I have tried. Rated 4 out of5 byAUDREYBON_3711413247 fromMy cats love these treats so much they barely bother with chewing them and instantly are looking for more. I tend to give food treats on an irregular basis but with how much they love these it's difficult not to cave to their cravings. Chicken By-product Meal, Ground Corn, Animal Fat (Preserved With Mixed Tocopherols), Dried Meat By-products, Brewers Rice, Wheat Flour, Natural Flavours, Grain Distillers Dried Yeast, Potassium Chloride, Choline Chloride, Salt, Caramel Colour, Taurine, Dl-methionine, Calcium Carbonate, Vitamins (Dl-alpha Tocopherol Acetate [source Of Vitamin E], Vitamin A Acetate, Niacin Supplement, Vitamin B12 Supplement, Riboflavin Supplement, Thiamine Mononitrate, D-calcium Pantothenate, Biotin, Vitamin D3 Supplement, Pyridoxine Hydrochloride [vitamin B6], Folic Acid), Minerals (Zinc Sulphate, Copper Sulphate, Manganese Sulphate, Potassium Iodide), Natural Turkey Flavour, Mixed Tocopherols (Natural Preservative), Dried Cheese. 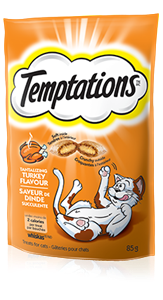 TEMPTATIONS® Tantalizing Turkey Flavour Treats for cats is formulated to meet the nutritional levels established by the AAFCO Cat food Nutrient Profiles for all life stages. AAFCO stands for the Association of American Feed Control Officials. AAFCO develops standards for dog and cat nutrient profiles which are used as model regulations in the United States. AAFCO feeding protocols are referenced the ""Guide for the Labeling and Advertising of Pet Foods"" endorsed by the Competition Bureau of Canada as well as in the Guidelines for the Canadian Pet Food Industry, developed and administered by the Pet Food Association of Canada. These documents were created to help pet food manufacturers ensure that the food that they manufacture, distribution and sale of animal feeds are safe and of high quality.